﻿Load Capacity	Up to 250 lbs. 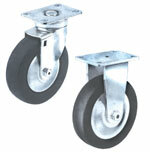 • ﻿﻿Top Plate & Yoke: Heavily embossed, formed steel to extend caster life under rugged conditions. • Axle: 3/8” diameter hollow axle with lock nut. ﻿Load Capacity	Up to 300 lbs. 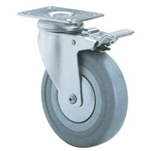 • ﻿﻿﻿﻿Top Plate & Yoke: Heavily embossed, formed steel to extend caster life under rugged conditions. ﻿Load Capacity	Up to 185 lbs. ﻿Load Capacity	Up to 275 lbs. ﻿Load Capacity	Up to 230 lbs. • All moving parts are hardened to a precise molecular depth and Rockwell hardness. Available in Swivel and Rigid models. ﻿Load Capacity	Up to 110 lbs. 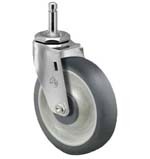 ﻿﻿• Computers or other laboratory or office equipment mounted on these casters will easily roll over floor irregularities such as carpet edges, thresholds, etc. 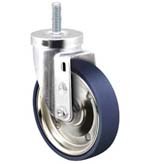 • If the unit is dropped or otherwise subjected to a sudden load, the caster will provide smooth shock absorption. The caster will not suddenly “hit bottom” or abruptly come to the limit of the caster spring system. to withstand a certain maximum, usually expressed in “g’s”. ﻿﻿Vastly reduces rusting under wet conditions. Used extensively in hospital laundries and food service areas, the CartWash 2000 reduces maintenance and provides extra life to both caster and equipment. Available in the 60 and 80 series to cover a wide range of sanitary applications found in hospitals, hotels, pharmaceutical labs, clean rooms, meat packing plants and food industries. ﻿﻿• ﻿Design: heavy gauge cold rolled steel, formed for strength. • Axle: 3/8” diameter bolt with lock nut. ﻿﻿﻿• Design: heavy gauge cold rolled steel, formed for strength. ﻿• Design: heavy gauge cold rolled steel, formed for strength. ﻿﻿• Design: heavy gauge cold rolled steel, formed for strength. ﻿﻿﻿• Finish: bright zinc plating to resist rust and corrosion. • Design: heavy gauge cold rolled steel, formed for strength. raceway bearings and improves performance. • King Pin: 1/2” steel rivet, hydraulically upset. ﻿• Finish: bright zinc plating to resist rust and corrosion. ﻿﻿• Finish: bright zinc plating to resist rust and corrosion. • Dust Cap: all swivel models feature dust cap which protects swivel raceway bearings and improves performance. ﻿﻿﻿﻿﻿• Finish: bright zinc plating to resist rust and corrosion. • Axle: 3/8” diameter riveted nut and bolt. ﻿﻿﻿﻿﻿﻿• Ideally suited for medical, high-tech and institutional equipment. • Sleek, advanced design combines corrosion and chemical resistance with silent operation. • Molded from engineered, reinforced thermoplastics for trouble-free performance even in wash-down applications. • Steel top plates and mounting stems are zinc plated to resist rust. • Axle: 3/8” diameter riveted. • ﻿﻿﻿﻿﻿﻿﻿﻿﻿﻿﻿﻿Design: pressed steel, double ball raceway swivel. • Brake Pedal: chrome plated, zinc alloy standard. • Thread Guards: plastic, except where noted. • Axle: 5/16" diameter bolt with lock nut. 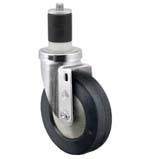 Click here to see a full range of Options & Spare Parts for the 2J Jarvis Series Casters. ﻿﻿﻿• Dust Cap: all swivel models feature dust cap which protects swivel raceway bearings and improves performance. • Swivel Construction: stainless steel grade 440 ball bearings with hardened double raceway construction. Bearings are magnetic. • Axle: 3/8” diameter stainless steel axle with lock nut. • King Pin: 1/2” stainless steel rivet, hydraulically upset. 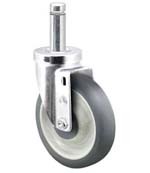 ﻿﻿﻿﻿﻿• Dust Cap: all swivel models feature dust cap which protects swivel raceway bearings and improves performance. hardened double raceway construction. Bearings are magnetic. • ﻿﻿﻿﻿﻿﻿﻿﻿﻿﻿﻿﻿Design: polished stainless steel, double ball raceway swivel yoke. • Thread Guards: stainless steel. Load Capacity Up to 240 lbs.